Large Collection of Bedroom Sets. Buy Bedroom Set from Brixton Beds on Guaranteed Lowest Prices, Same Day / Next Day Delivery to Room of Choice. Bedroom Set There are 54 products. The Miami range is colourful, functional and easy to assemble.This Miami 4 + 2 drawer chest from GFW is simply fabulous.The Miami range avaliable in two different colors.Pretty bun feet, metal drawer runners and lots of storage space. This chest of drawers is incredible value. Amazon Trio Wardrobe, Chest & Bedside Set in Distressed Pine - Sold as 3 pc Set - 2 Door Wardrobe full hanging with shelf, 4 Drawer Chest of Drawers and 1 Drawer Bedside Cabinet. 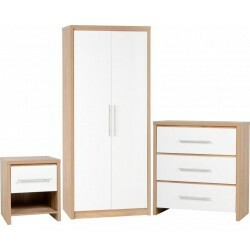 A stylish oak bedroom furniture set, perfect for the modern teenage or student bedroom. Ideal buy for Landlords.